On 2 May at 0703 an eruption at Marapi produced a dense, gray ash plume that rose 4 km above the crater rim and drifted SE. The Alert Level remained at 2 (on a scale of 1-4). Residents and visitors were advised not to enter an area within 3 km of the summit. The Marapi volcano on Sumatra (not to be confused with the better known Merapi volcano on Java) previously erupted on 4 June 2017, generating dense ash-and-steam plumes that rose as high as 700 m above the crater and caused minor ashfall in a nearby district (BGVN 42:10). 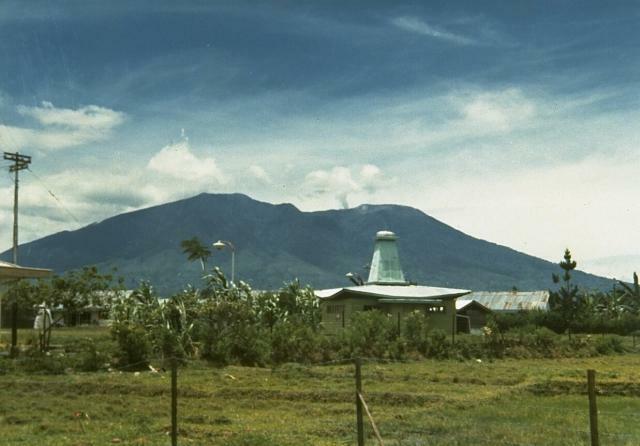 The volcano is monitored by the Pusat Vulkanologi dan Mitigasi Bencana Geologi (PVMBG, also known as Centre for Volcanology and Geological Hazard Mitigation or CVGHM). On 27 April 2018, a phreatic explosion produced an ash plume that rose 300 m above the crater rim (figure 8); a thin ash deposit was reported in the Cubadak area (Tanah Datar Regency), about 12 km SE. Another explosion at 0703 on 2 May 2018 (figure 9) produced a voluminous dense gray ash plume that rose 4 km above the crater rim and drifted SE; seismic data recorded by PVMBG indicated that the event lasted just over 8 minutes (485 seconds). The Alert Level has remained at 2 (on a scale of 1-4), where it has been since August 2011. Residents and visitors have been advised not to enter an area within 3 km of the summit. Figure 8. Ash plume from a phreatic explosion at Marapi on 27 April 2018. Courtesy of Sutopo Purwo Nugroho (BNPB). Figure 9. An explosion from Marapi on 2 May 2018 sent an ash plume to a height of 4 km. Courtesy of PVMBG. Information Contacts: Pusat Vulkanologi dan Mitigasi Bencana Geologi (PVMBG, also known as Indonesian Center for Volcanology and Geological Hazard Mitigation, CVGHM), Jalan Diponegoro 57, Bandung 40122, Indonesia (URL: http://www.vsi.esdm.go.id/); Badan Nasional Penanggulangan Bencana (BNPB), National Disaster Management Agency, Graha BNPB - Jl. Scout Kav.38, East Jakarta 13120, Indonesia (URL: http://www.bnpb.go.id/). On 27 April a phreatic eruption at Marapi produced an ash plumes that rose 300 m above the crater rim. The Alert Level remained at 2 (on a scale of 1-4). Residents and visitors were advised not to enter an area within 3 km of the summit. PVMBG reported four explosions at Marapi on 4 June, each lasting less than one minute. The explosions occurred at 1001, 1011, 1256, and 1550, and produced dense ash-and-steam plumes that rose 300 m, at least 700 m, 200 m, and 250 m above the crater, respectively. The plumes drifted E. Ejected bombs were deposited around the crater. Seismicity increased after the explosions. Minor ashfall was reported in the Pariangan District (8 km SSE), Tanah Datar Regency. The Alert Level remained at 2 (on a scale of 1-4). Residents and visitors were advised not to enter an area within 3 km of the summit. PVMBG reported that on most days during periods of clear weather from 1 November 2015 to 19 January 2016 white plumes rose above Marapi as high as 250 m above the crater. A phreatic explosion at 2233 on 14 November generated an ash plume, and ashfall was noted in Panyalaian and Aia Angek on the SW flank. Seismicity fluctuated during 1-18 January; earthquakes indicating emissions, tornillo-type events, and shallow volcanic signals slightly increased. The Alert Level remained at 2 (on a scale of 1-4). Residents and visitors were advised not to enter an area within 3 km of the summit. PVMBG reported that during 1 August-16 November diffuse white plumes rose as high as 150 m above Marapi, inclement weather prevented observations during October and periodically during the other months. Seismicity fluctuated; the number of tremor, tornillo-type, and signals indicating emissions increased. The Alert Level remained at 2 (on a scale of 1-4). Residents and visitors were advised not to enter an area within 3 km of the summit. PVMBG reported that during February-25 May diffuse white plumes rose as high as 300 m above Marapi, although inclement weather often prevented observations. Seismicity fluctuated. The Alert Level remained at 2 (on a scale of 1-4). Residents and visitors were advised not to enter an area within 3 km of the summit. According to news articles, an explosion at Marapi on 26 February produced an ash plume that caused ashfall in areas as far as 10 km S. According to PVMBG the Alert Level remained at 2 (on a scale of 1-4). According to a news article from 5 February four explosions from Marapi occurred in early February. One of the explosions was followed by ashfall in the Tarab River area and Batu Sangkar (17 km SE). According to news articles, an eruption from Marapi on 26 September produced an ash plume that rose 1.5 km above the crater. According to a news article, an approximately 10-minute-long eruption from Marapi produced an ash plume that rose 600 m on 18 May. The article noted that the Alert Level remained at 2 (on a scale of 1-4). 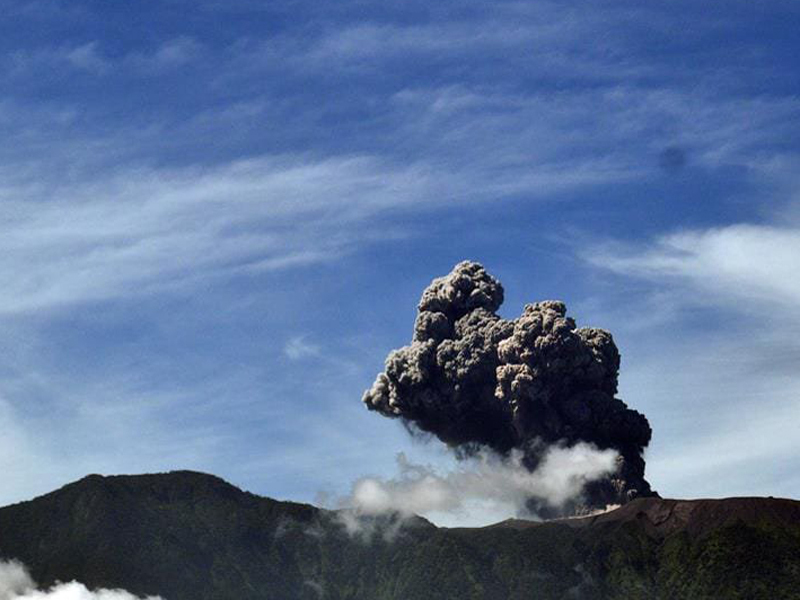 According to a news article from 5 March, several eruptions from Marapi produced ash plumes during the previous week. An ash plume rose 1 km above the crater on 4 March and drifted 10 km S. A representative from CVGHM noted that the Alert Level remained at 2 (on a scale of 1-4). Based on information from CVGHM, the Darwin VAAC reported that on 12 October an eruption from Marapi produced an ash plume that rose to an altitude of 3 km (10,000 ft) a.s.l. and drifted E.
Based on a pilot report, the Darwin VAAC reported that on 11 October an ash plume from Marapi rose to an altitude of 3.7 km (12,000 ft) a.s.l. Ash was not identified in satellite imagery. According to a news article, two eruptions from Marapi occurred on 9 August. The article also noted that the Alert Level remained at 2 (on a scale of 1-4). CVGHM reported increased seismicity from Marapi during 21 June-3 August. Observers noted that during June and July white plumes rose 15-75 m above the summit craters. On 1 August white plumes rose 15 m above the main crater; fog prevented observations the next day. On 3 August dense gray plumes rose 300-1,000 m above the crater on eight occasions. That same day CVGHM raised the Alert Level to 2 (on a scale of 1-4). Visitors and residents were prohibited from going within a 3-km radius of the summit. DVGHM raised the Alert Level at Marapi from 1 to 2 on 18 July after the number of earthquakes increased dramatically during 8-14 July. During this period, the volcano's seismic network recorded 112 deep volcanic earthquakes. Normally, an average of 7 deep volcanic earthquakes occur in 1 week. No significant activity changes were seen at the volcano; gas emissions rose ~50 m above the summit (9,650 ft a.s.l.) and fumarole temperatures were normal. Increased volcanic activity at Marapi during early August led DVGHM to raise the Alert Level to 2 from 1 (on a scale of 1-4) on 5 August. Ash explosions rose 500-1,000 m above the summit and no seismic data were available. Visitors and villagers in the Tanah Datar and Padang Panjang districts were advised not to climb the volcano. VSI reported that volcanic activity continued at Marapi at a decreased level in comparison to the previous week. Thirty explosions were observed and an ash plume rose 3 km above the summit. Tephra fell up to 4 km in radius from the crater. Marapi remained at Alert Level 2 (on a scale of 1-4). 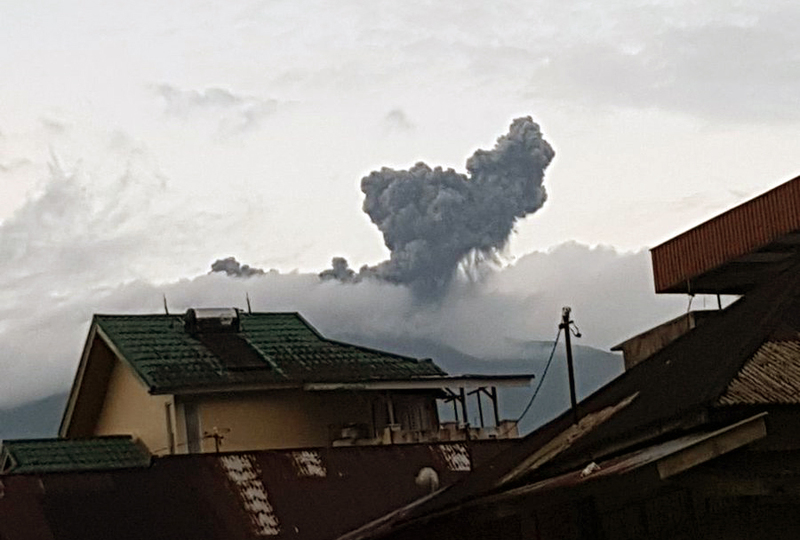 VSI reported that the Marapi eruption at 0814 on 16 April produced a cauliflower-shaped black ash plume that rose 2 km above the summit. Ash, lapilli, and volcanic bombs were ejected during the eruption and fell within the crater. In addition, ash fell in many villages on the S and SW flanks of the volcano. Within 1-4 km from the summit the thickness of the ash deposits was between 2 and 3 cm. Until 18 April approximately 150 smaller explosions continuously occurred. The 16 April eruption was preceded by shallow volcanic earthquakes that began on 7 April and by continuous volcanic tremor recorded on 9 April. Small eruptions occurred at 1283 and 1600 on 13 April. VSI had increased the Alert Level at Marapi from 1 to 2 following the minor activity that began on 13 April. Based on information from VSI, the Darwin VAAC reported that after increased volcanic activity occurred over the preceding two weeks VSI raised the Alert Level at Marapi from 1 to 2. The increased activity included an eruption on 16 April that sent an ash cloud up to 2 km above the summit. In addition, an eruption on about 23 April produced an ash cloud that rose up to ~6 km a.s.l. and drifted to the E.
At 1830 on 8 September Marapi ejected a thick blackish-gray cauliflower-shaped cloud to 1500 m above the crater, accompanied by glow and a roaring noise. Andesitic ash and lapilli fell on a 30 km2 area. This explosion was preceded by a number of smaller ones that produced 300-500-m-high clouds. Fumarolic emissions, rising as much as 700 m and containing some ash, were continuing as of 18 September. No seismicity was felt in villages around the volcano. The activity originated from the lateral extension of a small, pre-existing, summit area crater (figure 1), ~300 m E of the central crater. When visited on 13 September the active crater was an elongate feature 95 m long, 50 m wide, and ~50 m deep. Figure 1. Sketch map showing Marapi's summit area and the 1978 eruption crater. Courtesy of VSI. Information Contacts: F. Suparban Mitrohartono, VSI. According to press reports, 60 persons were killed by an eruption of Marapi during the morning of 30 April [but see below], and rescue workers searched for 19 others believed trapped by "landslides." The volcano was said to have ejected "stones" and "mud" or "lava," causing damage in at least five villages. The deaths were apparently caused by large airfall tephra. Information Contacts: AFP; Kompas, Jakarta. Press reports describing a tephra eruption of Marapi on 30 April were incorrect. About 300 mm of rainfall remobilized an old lahar and other volcanic material on Marapi's N and E flanks, producing several landslides. The largest began at 2,400 m altitude on 30 April, and traveled as much as 20 km downslope to ~70 m altitude, leaving a deposit 20-150 m wide and 1-3 m thick. Eighty people were killed, five villages were damaged, and several acres of farmland were destroyed. A VSI team inspected Marapi's crater on 8 May. Fumaroles emitted thin white vapor columns that had a slight sulfur odor and a temperature of 90-104°C. Information Contacts: F. Suparban Mitrohartono and A. Sudradjat, VSI. A small eruption of Marapi occurred on 11 September. The eruption column rose 700 m and deposited ash to ~3 km W of the volcano. An inspection revealed that three summit-area craters (Verbeek, C, and Tuo) had been active. No activity has been reported since then. Information Contacts: A. Sudradjat, VSI. Indonesian newspapers reported that Marapi ejected a black eruption column for about 30 minutes beginning at 0700 on 10 March. The governor of West Sumatra noted that there have been two previous small eruptions in 1982. Camps have been prepared to receive evacuees if a large eruption occurs. Information Contacts: M. Krafft, Cernay, France. On 15 November at 0500 Marapi emitted a white to brownish plume. A small, possibly phreatic, eruption occurred at 0830, ejecting a blackish plume to about 400 m height. No additional activity was reported. No residents were evacuated. Small explosions occurred on 25 and 30 May, and 1, 5, 7, 9, 10, and 11 June, with column heights reaching 1 km above the summit. A light dusting of ash fell on Bukittinggi,  km NW [of the summit], and Padang,  km [SSW]. The previous activity at Marapi occurred 15 January. At least 17 small explosions were recorded during December. One of the largest, on 7 December at 0648, sent a plume from the summit area's Verbeek Crater to ~900 m height. Additional larger explosions occurred on 24 December at 0625 (plume to 1,000 m) and on 27 December at 0007 (plume not visible). Other plumes from December explosions reached 700-1,000 m above the crater. Light ashfall was reported from a wide area of W Sumatra. Ash from an eruption around midnight on 28-29 January was carried S toward Padang city. Three millimeters of ash fell in Padangpanjang,  km [SW] of [the summit]. Marapi erupted again on 19, 20, and 24 February, and 1 March. Fresh, unaltered rock has been found in the tephra from the 1988 explosions. On 1 March at 1311, a single explosion occurred from the summit crater, depositing as much as 1 mm of ash to 9 km of the summit. Single explosions ejected ash-laden eruption columns to 1 km above the vent on 7 and 8 July [see also 13:7]. Small explosions occurred 1 July at 1420 and 8 July at 1900, depositing 0.5 mm of ash in Bukittinggi. An explosion on 5 July killed one person and injured five others. Marapi has been erupting since 1987, with explosions typically occurring about once every 1-7 days. Material ejected by the smaller explosions rises 100-800 m, whereas ejecta from larger explosions reach 800-2,000 m above the summit. The recent explosions, which produce ash and lapilli, have originated from Verbeek Crater in the summit complex. Ashfalls have been frequent NW of the volcano in Bukittinggi (roughly 15 km NW of the summit), Sungai Puar (30 km NW), and the Agam district (>30 km NW), depending on wind direction. Fluctuations in Marapi's explosions seem to parallel shallow volcanic earthquakes (figure 2), suggesting that the activity is primarily caused by degassing from a relatively shallow source through an open vent. Figure 2. Number of explosion, A-, and B-type earthquakes at Marapi, January 1991-June 1992. Courtesy of VSI. Activity in June began with an explosion on the 1st. Continuous tremor followed, and on 6 June at 0227 another explosion occurred. Repeated explosions then deposited ~0.5 mm of ash on Bukittinggi. On 25 June, witnesses 2 km from the volcano (at the Batu Palano Volcano Observatory) heard a detonation and saw glow. A brownish-black cauliflower-shaped plume rose 1,800 m above the summit. During June, 45 deep and 312 shallow volcanic earthquakes, 108 volcanic tremor episodes, and 2,104 explosion earthquakes were recorded. The strongest explosion occurred on 5 July at 0912. Bukittinggi and vicinity were covered by 0.5-1.5 mm of ash several hours later, with ash in some areas reaching 2 mm thickness. Ash also extended to Padang, ~10 km SW of the crater. Bombs killed one person, seriously injured three, and caused minor injuries to two others. The victims had climbed to the summit without consultation with the Mt. Marapi Volcano Observatory or local authorities, although a hazard warning had been in effect since 1987. Information Contacts: W. Modjo, VSI. An eruption at 0016 on 12 August 1994 sent an ash column to ~6 km altitude, a height of 3,200 m above the summit. Another explosion at 0046 ejected ash 280 m high. From the observatory ~7 km from the crater, observers noted incandescent projections as high as 300 m above the crater rim, accompanied by explosion sounds and vibrations. Ashfall in and around the city of Bukittinggi . . . ranged from 0.5 to 1 mm thick. Shallow volcanic earthquakes were recorded after the explosions, but gradually decreased. Eruptions during the first half of 1993 (VSI, 1993a) produced lapilli and ash that were deposited in a radius of 1.5-3 km from the active crater. A dark gray column rose as high as 1,200 m above the summit . . . , but was usually in the 400-500 m range. Explosion earthquakes from January to July 1993 fluctuated between 1 and 77 events/day. The frequency of explosions increased in July 1993, but then decreased from August through December (VSI, 1993b). These explosions during Jul-Dec 1993 deposited lapilli and ash within a 750-m-radius of the active crater. Incandescent material fell within a few tens of meters of the crater rim. Average plume height in the second half of 1993 was 400-800 m, reaching a maximum of 3,200 m above the summit. Throughout 1993, deep volcanic earthquakes (A-type) were detected at a rate of 6-41/month. Between 42 and 338 shallow (B-type) events were recorded each month. Activity of Marapi volcano was subdued during the period from late April to late May. From 27 April-3 May, only the emissions events increased (from 21 to 30) from the previous week; volcanic type-A, type-B, and tectonic events, along with eruptions, all decreased. During 4-17 May observed activity was limited to thin white-gray ash emissions that rose 100-400 m above the summit. Information Contacts: Volcanological Survey of Indonesia (VSI), Jalan Diponegoro No. 57, Bandung 40122, Indonesia (URL: http://www.vsi.esdm.go.id/). Moderate eruptive activity at Marapi during June-September was interrupted by a few isolated powerful explosions. On 1 June a loud detonation was heard and earthquakes were felt in Bukittinggi village near the volcano. These phenomena were followed by an outpouring of thick dark ash from the crater forming a billowing cloud reaching 3,200 m above the summit. Events soon returned to more typical emissions of white or gray ash rising a few hundred meters and not accompanied by detonations. During 3-9 August white and sometimes black ash plumes reached 200-1,200 m above the peak. There were also increases in the number of volcanic and small explosive seismic events recorded that week. J. Bardintzeff reported that at 0720 on 5 August a violent explosion sent an ash column, at first black but later gray in color, ~1,000 m above the summit. Fine ash fell at distances of up to 1 km E of the volcano at 0745. Two groups of people were standing near the crater at the time of the explosion. 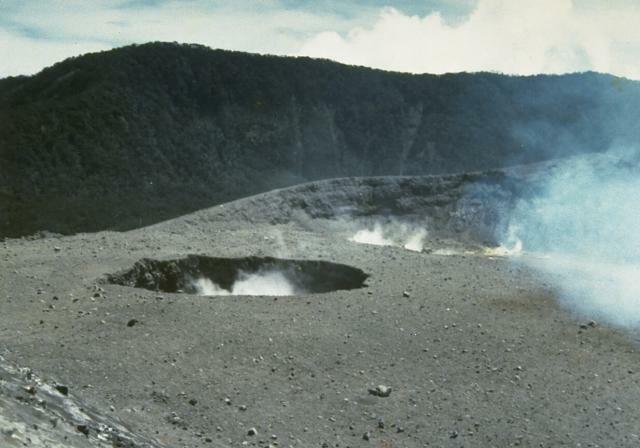 A group near the west side was safe, but three people of another group standing at the eastern crater rim were injured. Witnessed said that they were knocked down by the force of the explosion in which several 10-cm-diameter bombs were ejected. The injuries included cuts from debris and burns about the face, head, arms, and hands. Several people have been killed or injured at Marapi during the past ten years. Information Contacts: Volcanological Survey of Indonesia (VSI), Jalan Diponegoro No. 57, Bandung 40122, Indonesia (URL: http://www.vsi.esdm.go.id/); Jacques-Marie Bardintzeff, Laboratoire de Petrographie-Volcanologie, bat 504, Universite Paris-Sud, 91405, Orsay, France. At 0553 on 11 March 2000, a significant explosion ejected thick black ash that rose 1,400 m above the summit. Explosions and ash emissions continued and increased in magnitude. At 0944 on the following day, a large explosion was heard more than 25 km away in the community of Bukittinggi. The explosion sent thick, black ash to a height of 3,000 m. Ashfall was reported ~350 km N of Marapi on the Lima Kaun District of Tanah Datar. Both major explosions were immediately preceded by shallow volcanic (B-type) earthquakes, while heightened seismicity, especially A- and B-type earthquakes, occurred up to a week before the explosions. By 14 March explosions and ash emissions were continuing with decreased intensity. The gray-black plume rose 200 m above the crater rim. The following week seismicity increased notably with all earthquakes types increasing in number. During the [week of 28 March-3 April], black ash emissions continued to rise 100-200 m. Seismicity increased slightly compared to the previous week, but remained much lower than when the explosions initiated. Information Contacts: Dali Ahmad, Volcanological Survey of Indonesia (VSI), Jalan Diponegoro No. 57, Bandung 40122, Indonesia (URL: http://www.vsi.esdm.go.id/). On 11 March 2000, an explosion at Marapi ejected thick black ash that rose 1.4 km above the summit (BGVN 25:11). Explosive activity occurred again in 2001, peaking during 13-18 April, when a total of 150 explosions occurred that sent ash plumes to 2 km above the summit. From January to February 2001, monthly A-type earthquakes had decreased from 15 to 8, and B-type earthquakes had decreased from 24 to 14. Gas-and-steam emissions, however, had increased from 11 events during January to 41 times during February. B-type earthquakes were registered on 7 April and continuous volcanic tremor occurred on 9 April. On 14 April at 1600 a thick dark ash plume was visible from Bukittinggi, 15 km NW of Marapi's summit. On 16 April at 0600 an explosion sent a thick black ash plume to 700 m above the summit. At 0814 the same day a loud explosion was heard 8 km from the volcano, and a black mushroom-shaped ash plume rose to 2 km above the summit. Ejected incandescent fragments were seen clearly from Bukittinggi and then fell back to the crater rim. Ash fell over the villages of Sungai Puah, Air Angeh, and Andala, and in District X Koto, District Batipuh, District V Koto, Tanah Datar Regency, and Padang Panjang City in the zone S and SW of the summit. Ash deposits 1-4 km from the summit were 2-3 cm thick. The Marapi Volcano Observatory increased the Alert Level from 1 to 2 following the activity that began on 13 April and a recommendation was issued by the local government to prevent people from traveling to the summit area. Volcanic activity at Marapi continued through at least June 2001 (table 1). On 8 May at 2240, an explosion was accompanied by a moderate booming sound heard from the Tandikat observatory. Ash from the explosion spread to the NW, to Kota Bary, Padangpanjang, Lo Koto, and around the Tandikat observatory. Table 1. Earthquakes and plumes reported at Marapi during 23 April-10 June 2001. Courtesy of VSI. 23 Apr-29 Apr 2001 58 -- 30 -- Gray-black plume to 3.0 km; volcanic materials fell 4.0 km from volcano. Five explosion earthquakes were accompanied by loud noise. 30 Apr-06 May 2001 27 22 4 -- Gray plume to 1.2 km above summit. 07 May-13 May 2001 16 46 14 1 Whitish-gray thick plume to 1.5 km above summit. 04 Jun-10 Jun 2001 2 -- 2 2 Explosion earthquakes had 33.6 mm maximum amplitudes. An explosion that began at 0445 on 5 June sent ash to the SSW. The ash was 0.5-2 mm thick in places. Merapi remained at Alert Level 2 through at least 10 June 2001. Information Contacts: Dali Ahmad, Volcanological Survey of Indonesia (VSI) (URL: http://www.vsi.esdm.go.id/). 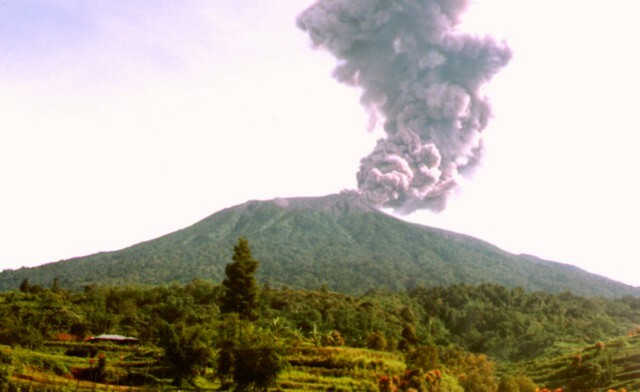 The most recent previous explosive activity at Marapi peaked during 13-18 April 2001, when a total of 150 explosions occurred that sent ash plumes to 2 km above the summit (BGVN 27:01). This report covers the interval 5 August to 10 October 2004. On 5 August 2004 Marapi generated a small eruption with a gray to black ash cloud that rose to 500-1,000 m above the summit. Its hazard status was raised to Alert Level II (yellow), where it remained throughout this period. Total numbers of seismic events from 2 August through 10 October 2004 are listed in table 2. During some weeks in August the number of earthquakes increased markedly. A thin white plume rose to 50 m above the summit on 10 August. During 16-29 August a thin white-gray plume rose to ~ 75-100 m. Similar plumes rose to ~ 50 m during 27 September-3 October and to ~ 300 m during 4-10 October. Seismic signals inferred to be related to emissions were elevated during several weeks of the reporting interval, particularly in August (table 2). Table 2. A summary of volcanic seismicity at Marapi during 2 August to 10 October 2004. Courtesy of DVGHM. There were no MODIS-MODVOLC alerts at Marapi during 2004. Information Contacts: Directorate of Volcanology and Geological Hazard Mitigation (DVGHM), Jalan Diponegoro 57, Bandung 40122, Indonesia (URL: http://www.vsi.esdm.go.id/); Darwin Volcanic Ash Advisory Center (VAAC), Bureau of Meteorology, Northern Territory Regional Office, PO Box 40050, Casuarina, NT 0811, Australia (URL: http://www.bom.gov.au/info/vaac/). This report first describes a 2005 increase in seismicity at Marapi, then presents a 2010 field map of Marapi's active crater area, and notes several plumes seen in 2011 to 1 km above the vent, some bearing ash. As previously noted, Marapi had generated explosions in 2000 and 2001, and a small ash-bearing eruption in 2004 (BGVN 25:11, 27:01, and 30:01). Activity during 2005. During the week 8-14 July 2005, the number of earthquakes at Marapi increased dramatically. The seismic network recorded 112 deep volcanic earthquakes, compared to a normal average of 7 per week. Other changes were absent at the volcano, for example, fumarole temperatures were normal and gas emissions typically rose ~ 50 m above the summit. As a result of the increased seismicity, the Center of Volcanology and Geological Hazard Mitigation (CVGHM) raised the Alert Level from 1 to 2 (on a scale of 1-4). Activity during 2010. During a 4-day visit to Marapi in July 2010, volcanologist Mary-Ann del Marmol created a sketch map of the area (figure 3). More detailed mapping and rock observations of the old crater side of the volcano were thwarted by dense vegetation there. Figure 3. A sketch map of Marapi's active crater and vicinity prepared in the course of fieldwork during July 2010. The labels "S.A. Bonjol" and "S.A. Sabu" identify drainages. Courtesy of Mary-Ann del Marmol (University of Ghent, Belgium). Activity during 2011. According to CVGHM, seismicity increased during 21 June-3 August 2011. Observers noted that during June, July, and the first day of August white plumes rose 15-75 m above the summit craters. On 3 August dense gray plumes rose 300-1,000 m above the crater on eight occasions. That same day CVGHM raised the Alert Level again to 2. Visitors and residents were prohibited from going within a 3 km radius of the summit. 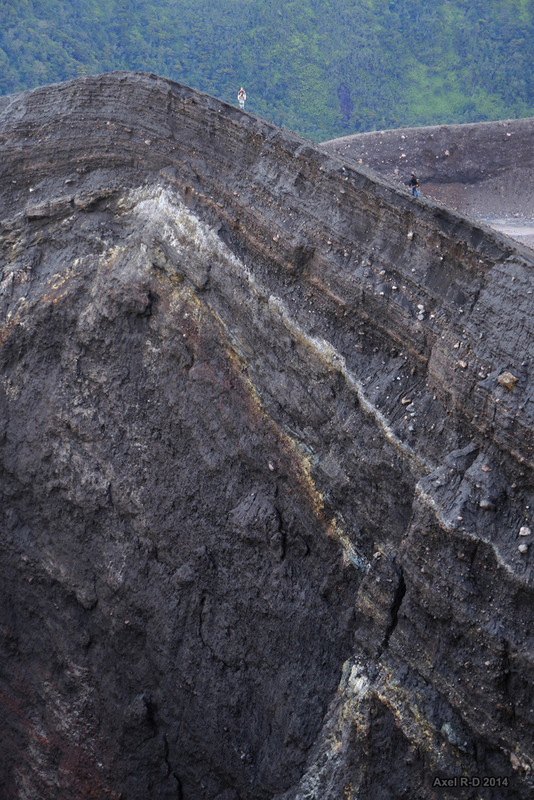 According to a news article, two eruptions from Marapi occurred on 9 August 2011. Information Contacts: Center of Volcanology and Geological Hazard Mitigation (CVGHM), Jalan Diponegoro 57, Bandung 40122, Indonesia (URL: http://vsi.esdm.go.id/); Mary-Ann del Marmol, Geology and Soil Science Department, University of Ghent, Krijgslaan, 281 S8/A.326, B-9000 Gent, Belgium (URL: http://www.volcanology.ugent.be/delmarmol.htm); Metro TV News (URL: http://www.metrotvnews.com/). Eruptive activity at Marapi was absent for seven years following a short ash explosion in August 2004 (BGVN 30:01). Intermittent activity began again with eruptions in August and October 2011, followed by ash plumes during February-March 2012 and February 2014. The only additional information after the February 2014 activity was a Center of Volcanology and Geological Hazard Mitigation (CVGHM) report that during February-25 May 2015 diffuse white plumes rose as high as 300 m and seismicity fluctuated. The CVGHM kept the Alert Level at 2 (on a scale of 1-4), a status where residents and visitors are advised not to enter an area within 3 km of the summit. Activity during 2011. Ash eruptions on 3 August 2011 had been preceded by increased seismicity and white plumes since 21 June (BGVN 36:07). Dense gray plumes rose 300-1,000 m above the crater on eight occasions that day; two more eruptions occurred on 9 August. No further activity was noted until the Darwin Volcanic Ash Advisory Centre (VAAC) reported that a pilot on 11 October saw a plume rising to an altitude of 3.7 km, though ash was not identified in satellite imagery. However, based on information from CVGHM, the VAAC reported that on 12 October 2011 an ash plume rose to an altitude of 3 km and drifted E.
Activity during 2012. According to a BNO News article from 5 March 2012, several eruptions had produced ash plumes during the previous week (approximately 27 February-4 March), with one that rose 1 km above the crater on 4 March and drifted 10 km S. An approximately 10-minute-long eruption produced an ash plume that rose 600 m on 18 May which was described in an MI News article. Media reports (Big Pond News) noted another eruption on 26 September with an ash plume that rose 1.5 km above the crater. Activity during 2014. According to a news article from 5 February 2014 (Metro TV), four explosions occurred in early February. One was followed by ashfall in the Tarab River area and Batu Sangkar (17 km SE). News media reported an explosion on 26 February that caused ashfall in areas as far as 10 km S.
Information Contacts: Indonesian Center of Volcanology and Geological Hazard Mitigation, Pusat Vulkanologi dan Mitigasi Bencana Geologi (PVMBG, also known as CVGHM), Jalan Diponegoro 57, Bandung 40122, Indonesia (URL: http://www.vsi.esdm.go.id/); Darwin Volcanic Ash Advisory Centre (VAAC), Bureau of Meteorology, Northern Territory Regional Office, PO Box 40050, Casuarina, NT 0811, Australia (URL: http://www.bom.gov.au/info/vaac/); Metro TV News (URL: http://www.metrotvnews.com/read/newsvideo/2011/08/10/133771/Gunung-Marapi-Masih-Waspada); BNO News (URL: http://channel6newsonline.com/2012/03/indonesias-mount-marapi-still-highly-active/); MI News 26 (URL: http://www.minews26.com/content/?p=16895); Big Pond News (URL: http://bigpondnews.com/articles/World/2012/09/27/Volcano_erupts_with_smoke_on_Sumatra_799600.html); Metro TV (URL: http://www.metrotvnews.com/); The Free Press Journal (URL: http://freepressjournal.in/volcano-erupts-in-indonesia-2/). Explosions occurred at Marapi (not to be confused with the better known Merapi on Java) during August 2011; March, May, and September 2012; and February 2014 (BGVN 40:05). This report discusses activity during 2015 and 2016. All information was provided by the Indonesian Center of Volcanology and Geological Hazard Mitigation (PVMBG, also known as CVGHM). During the reporting period, the Alert Level remained at 2 (on a scale of 1-4); residents and visitors were advised not to enter an area within 3 km of the summit. According to PVMBG, diffuse white plumes rose as high as 300 above Marapi's crater during February-25 May 2015, 150 m above the crater during 1 August-16 November 2015, and 250 m above the crater during 1 November 2015-19 January 2016. Inclement weather often prevented observations. Seismicity fluctuated during this time, dominated by earthquakes centered a long distance from the volcano. However, tremor increased significantly during August 2015 through at least the middle of January 2016 (figure 4). A phreatic explosion at 2233 on 14 November 2015, generated an ash plume, and ashfall was noted in Panyalaian and Aia Angek on the SW flank. Figure 4. Types and daily number of earthquakes recorded at Marapi during 1 January 2015-18 January 2016. Key: eruptive earthquakes (Letusan), emission-type "blowing" earthquakes (Hembus), shallow earthquakes (VB), deep earthquakes (VA), local earthquakes (Lokal), and long-distance earthquakes (Jauh). The terms shallow and deep were not quantified. Courtesy of PVMBG (23 January 2016 report). Information Contacts: Pusat Vulkanologi dan Mitigasi Bencana Geologi (PVMBG, also known as Indonesian Center for Volcanology and Geological Hazard Mitigation, CVGHM), Jalan Diponegoro 57, Bandung 40122, Indonesia (URL: http://www.vsi.esdm.go.id/). Recent activity at the large Gunung Marapi stratovolcano on Sumatra has consisted of small ash plumes, with eruptions of a single day to periods of a few months. Ashfall around the active crater rim (figure 5) and thin layers of ash deposits seen in the crater wall (figure 6) provide evidence of both the recent and very long history of explosive activity. Since 2011 there have been eruptive episodes during August-October 2011, March-May 2012, 26 September 2012, February 2014, and 14 November 2015. 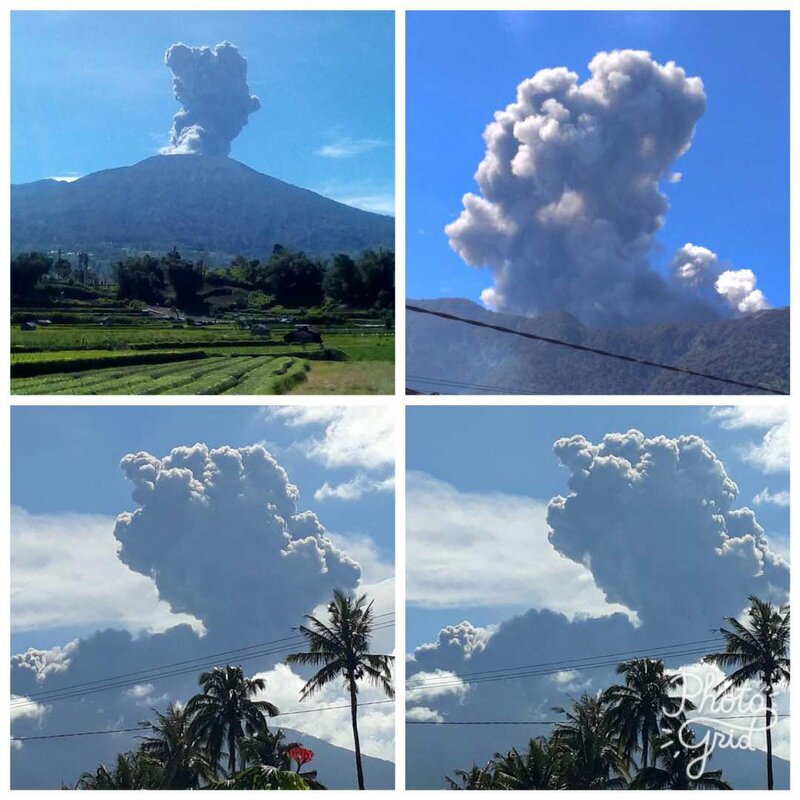 As reported by the Indonesian Center of Volcanology and Geological Hazard Mitigation (PVMBG), another series of explosions took place on 4 June 2017. Figure 5. Photo taken at the rim of the active Verbeek Crater at Marapi on 17 April 2014. The most recent eruption prior to this photo was during 3-26 February 2014. Courtesy of Axel Drainville. Figure 6. 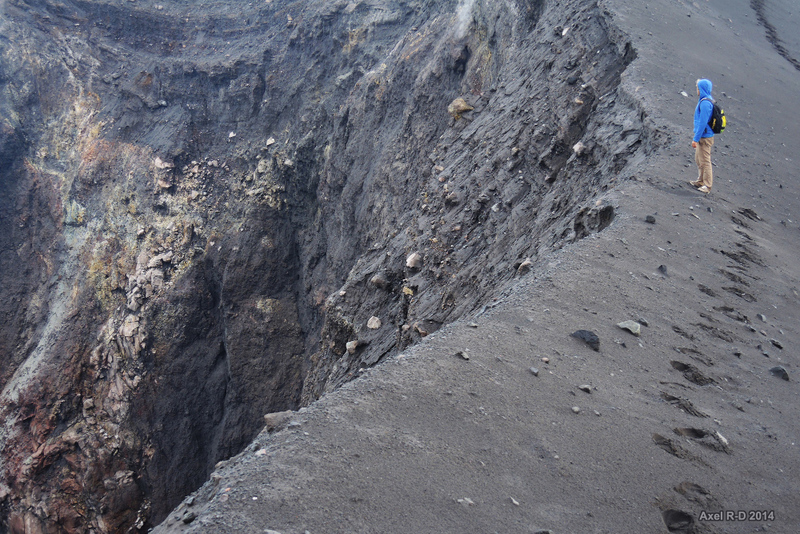 Photo showing the rim and interior wall of the Verbeek Crater at Marapi on 17 April 2014. Courtesy of Axel Drainville. Four explosions on 4 June lasted less than one minute each, and generated ash plumes above the summit (figure 7) and drifted E. The explosions occurred at 1001 local time (0301 UTC), 1011, 1256, and 1550. Dense ash-and-steam plumes from each explosion rose 300 m, at least 700 m, 200 m, and 250 m above the crater, respectively. The Darwin VAAC reported ash at about 3.6 km altitude extending 37 km ENE, based on satellite imagery. Ejected bombs were deposited around the crater, and minor ashfall was reported in the Pariangan District (8 km SSE), Tanah Datar Regency. Seismicity increased after the explosions. The Alert Level remained at 2 (on a scale of 1-4); residents and visitors were advised not to enter an area within 3 km of the summit. Figure 7. Photos of ash plumes rising from Marapi on 4 June 2017. The upper right image appears to show a smaller white plume to the right. Photos by PVMBG, posted to Twitter by Sutopo Purwo Nugroho (BNPB). The broad summit area with multiple craters is a popular destination for hiking expeditions. A video posted by YouTube user "SiGiTZ" documented the experience of one group during visits on 30 April 2016 and on 11 May 2017. The video provides excellent views from 2016 of the entire crater complex and of the Verbeek Crater, from which a steam-and-gas plume appears to be rising. A video posted by YouTube user "yogi antula" included a television broadcast from the Anak Borneo Channel of a video from climbers in the crater area during the 4 June explosions, taken from approximately 400-500 m away. In that video, a significant dark ash plume can be seen rising from Bungsu-Verbeek crater complex, along with a smaller white plume from a closer location. The news report was concerned with 16 hikers known to be on the mountain; there were no later reports of anyone being injured. References: SiGiTZ, 1 August 2017, Expedisi puncak Gunung Marapi Bukittingi Sumbar Mei 2017 (URL: https://www.youtube.com/watch?v=pVxhWAbo2VA). yogi antula, 5 June 2017, Video amatir pendakian saat Gunung Marapi Erupsi – 4 Juni 2017 (by Anak Borneo Channel) (URL: https://www.youtube.com/watch?v=8GAY6lsTLEE). Information Contacts: Pusat Vulkanologi dan Mitigasi Bencana Geologi (PVMBG, also known as Indonesian Center for Volcanology and Geological Hazard Mitigation, CVGHM), Jalan Diponegoro 57, Bandung 40122, Indonesia (URL: http://www.vsi.esdm.go.id/); Badan Nasional Penanggulangan Bencana (BNPB), National Disaster Management Agency, Graha BNPB - Jl. Scout Kav.38, East Jakarta 13120, Indonesia (URL: http://www.bnpb.go.id/); Sutopo Purwo Nugroho, Badan Nasional Penanggulangan Bencana (BNPB) (URL: https://twitter.com/Sutopo_BNPB); Axel Drainville, Flickr.com, with Creative Commons license Attribution-NonCommercial 2.0 Generic (CC BY-NC 2.0, https://creativecommons.org/licenses/by-nc/2.0/) (URL: https://www.flickr.com/photos/axelrd/). Gunung Marapi, not to be confused with the better-known Merapi volcano on Java, is Sumatra's most active volcano. This massive complex stratovolcano rises 2000 m above the Bukittinggi plain in the Padang Highlands. 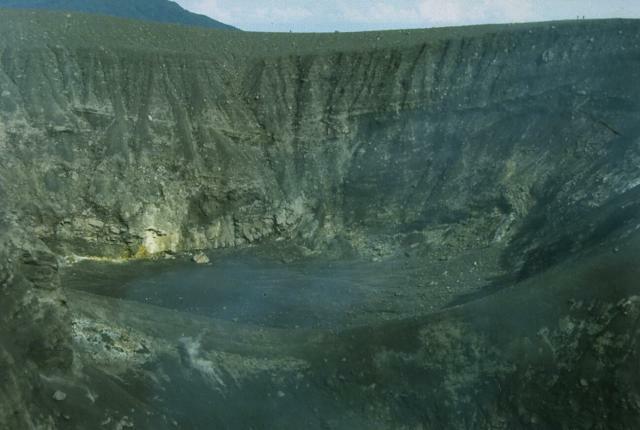 A broad summit contains multiple partially overlapping summit craters constructed within the small 1.4-km-wide Bancah caldera. The summit craters are located along an ENE-WSW line, with volcanism migrating to the west. More than 50 eruptions, typically consisting of small-to-moderate explosive activity, have been recorded since the end of the 18th century; no lava flows outside the summit craters have been reported in historical time. de Waard D, Klompe H F, 1952. The recent activity of G. Marapi in central Sumatra. Nat Tijd Ned-Indie, 108: 131-140. Hantke G, 1955. Ubersicht uber die Vulkanische Tatigkeit 1951-1953. Bull Volcanol, 16: 71-114. Westerveld J, 1952. Quaternary volcanism on Sumatra. Geol Soc Amer Bull, 63: 561-594. 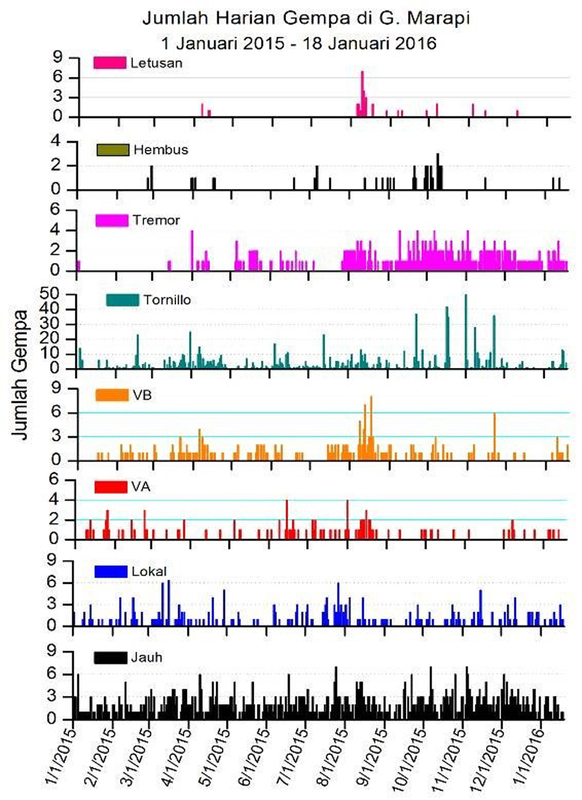 There is data available for 68 Holocene eruptive periods. There is no Deformation History data available for Marapi. There is no Emissions History data available for Marapi. Steam issues from two small craters near the center of Marapi's broad E-W-trending summit. The background ridge in the shadow is the eastern rim of a larger crater, Kebun Bungo. 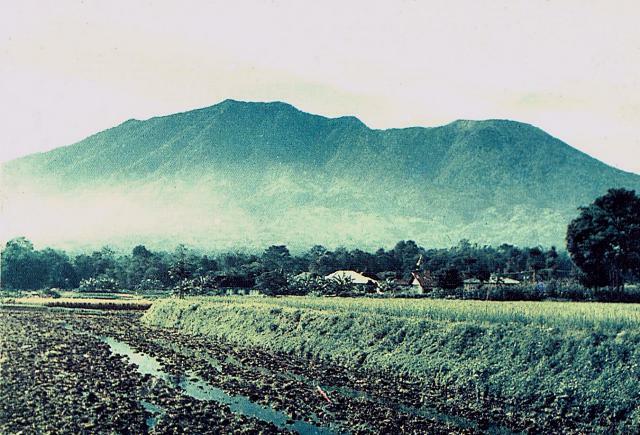 Photo by J. Mataheumual, 1978 (Volcanological Survey of Indonesia). Marapi, seen here from the west, has an elongated profile as a result of migration of summit craters along an E-W line. Marapi is Sumatra's most active volcano, with more than 50 small-to-moderate explosive eruptions since the end of the 18th century. Gunung Marapi, not to be confused with the more well-known Merapi volcano on Java, is a complex stratovolcano with multiple summit craters that rises 2000 m above the Padang Highlands in central Sumatra. 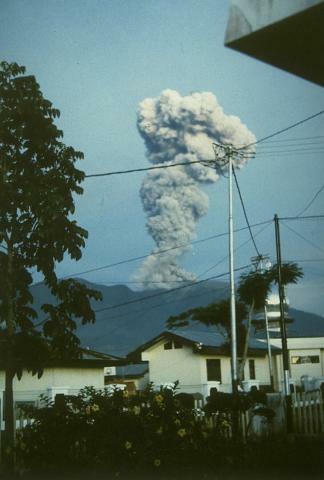 Photo by J. Matahelumual, 1978 (Volcanological Survey of Indonesia). The composite volcano Marapi rises 2000 m above the Padang Highlands of central Sumatra in this view from Padankuda. Sumatra's most active volcano, Marapi has produced more than 50 historical eruptions, all of which have originated from an broad E-W-trending line of summit craters. Photo by Agus Solihin, 1991 (Volcanological Survey of Indonesia). Steaming Kawah Verbeek is named after the renowned 19th-century Dutch geologist best known for his monograph on the 1883 eruption of Krakatau volcano. Kawah Verbeek, also known as Kapundan Tenga or Kepundan Tenga, is located at the western end of a chain of several historically active craters along an E-W line at the summit of Sumatra's Marapi volcano. Photo by Gede Suantika, 1992 (Volcanological Survey of Indonesia). The 325-m-wide Kepundan Bongsu, one of several historically active craters at the summit of Sumatra's Marapi volcano, is the largest and westernmost of a chain of craters covering a 1.2-km-long E-W line. Marapi is Sumatra's most active volcano, producing more than 50 small-to-moderate explosive eruptions since the end of the 18th century. Three small craters, Kepundan A, B, and C, seen here right-to-left, respectively, from the east, are oriented transverse to the elongated E-W-trending summit of Marapi volcano in Sumatra. A steam plume rises from Kepundan C. The craters are among the many vents at Marapi that have been active during historical time. An ash-rich eruption column rises above a town at the western foot of Sumatra's Marapi volcano on May 10, 1992. The activity was part of an ongoing eruption that began in January 1987 from Verbeek crater. The explosions frequently produced light ashfall in surrounding areas, but did not cause damage. The eruption included growth of a lava dome in the summit crater. The small craters Kepundan B and C in the foreground, seen here from the north, are two of many historically active craters along the elongated summit of Marapi volcano on Sumatra. A thick steam plume in the background rises above the westernmost summit crater, Kawah Bongsu. Photo by Gede Suantika, 1993 (Volcanological Survey of Indonesia). 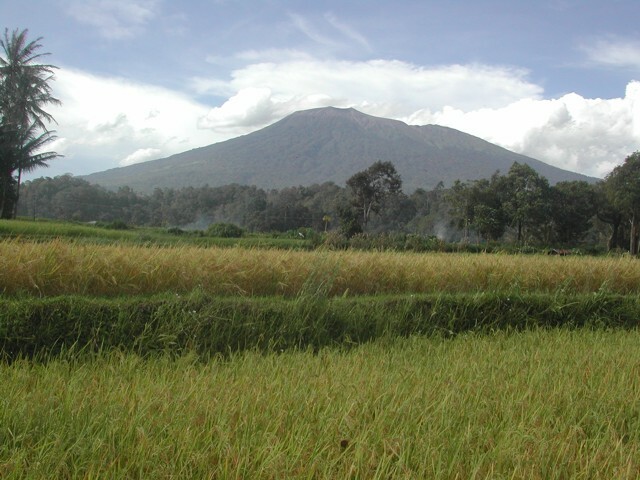 Marapi, rising above ricefields below its western flank between Bukittinggi and Kotabaru, is Sumatra's most active volcano. More than 50 small-to-moderate explosive eruptions have occurred since the end of the 18th century. Marapi, not to be confused with the more well-known Merapi volcano on Java, is a complex elongated stratovolcano with multiple summit craters that rises 2000 m above the Padang Highlands in central Sumatra. Photo by M. A. Syarif, 1987 (Volcanological Society of Indonesia). 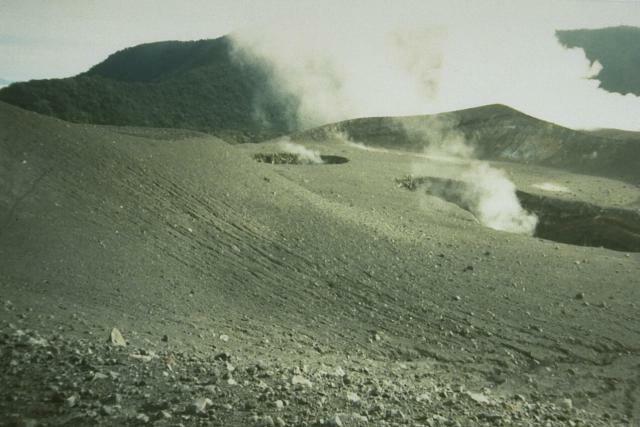 An ash plume rises from the summit crater of Marapi volcano in this undated photo, perhaps from the late 1980s or early 1990s. Marapi is Sumatra's most active volcano, and frequent small-to-moderate explosive eruptions have been recorded since the 18th century. Photo by Igan Sutawidjaja (Volcanological Survey of Indonesia). Forested Marapi, rising above ricefields, is Sumatra's most active volcano. More than 50 small-to-moderate explosive eruptions have occurred since the end of the 18th century. Marapi, not to be confused with the more well-known Merapi volcano on Java, is a complex elongated stratovolcano with multiple summit craters that rises 2000 m above the Padang Highlands in central Sumatra. Photo by Amin, 2003 (Centre of Volcanology & Geological Hazard Mitigation, Volcanological Survey of Indonesia). Large Eruptions of Marapi Information about large Quaternary eruptions (VEI >= 4) is cataloged in the Large Magnitude Explosive Volcanic Eruptions (LaMEVE) database of the Volcano Global Risk Identification and Analysis Project (VOGRIPA).